Parashat Ki Tetzei contains seventy two commandments, (some say 74: either way the largest number in any Torah portion). They deal with such diverse subjects as the treatment of captives, defiant children, lost animals, birds’ nests, roof railings, divorce, rights of aliens, loans, vows, and protection of works; parental guilt, charity for the poor, regulations for inheritance and fair weights and measures. Many attempts have been made to categorize such laws, but the words of Torah which conclude the duty to return lost property or to keep it safe until it can be restored to its owner – the words lo tuchal le’hitalem – you shall not remain indifferent (or you shall not hide or act as if you cannot see) seem to me to sum up the ethical principle which underpins these disparate laws most powerfully. Way back in the book of Genesis, when Cain says to God “am I my brother’s keeper?” the response from God is “What have you done, your brother’s blood calls out to Me from the ground” – in other words it is made clear to Cain that ‘Yes, we are responsible for each other; we must not remain indifferent to the situation of others, nor hide from their pain, nor avoid seeing their distress. More than that, we have to try to see ahead, to work out the possibilities that our actions or omissions may cause others. We are obliged to consider the effects of what we do upon other people. ‘Lo tuchal le’hitalem – you shall not remain indifferent’ It is a powerful dictum, a motto for every day life. It could have been formulated for our middle class existence, when people talk of compassion fatigue, of undeserving refugees; when we create rational and reasonable explanations for our unwillingness to care about the discomfort in the world we see around us. Lo tuchal le’hitalem – you shall not remain indifferent – it is an in-your-face moral and ethical requirement, taking us further into our humanity, reminding us that however practical Judaism is, however much a religion of doing, the doing is based on our shared humanity, our striving to reach a fuller and richer knowledge of our Source. Judaism is an infinitely complex way of being. There is no single Hebrew expression to approximate the word ‘religious’ – the use of idioms such as dati (legally observant) or charedi (quaking in the presence of the lord) are recent innovations, and they are not only inadequate and parochial, they distort the essence of Judaism. Judaism is not only about what one does and doesn’t do. It is more than what rituals you keep, or what time you separate. It isn’t lived only in the spiritual plane nor exclusively in the material world, but is rooted in the ethical and the moral. A legal code which tells us to behave properly towards others, to look after lost property even of your enemy, to make strenuous efforts to return that property – this we all understand and appreciate. But that extra expectation, – you shall not pretend not to see or to notice this property – you shall not hide yourself or be indifferent to your surroundings, however inconvenient it might be for you to notice them and therefore to have to respond to them – that is a quintessentially Jewish requirement, a teaching which fully recognises age old human rationalizations or ways of glossing over what we’d rather not deal with. At this time of year, in the month of Ellul, we examine our lives and the things we have done or left undone, affecting people around us as well as affecting ourselves. It is a time when we need to be honest, to stop hiding behind all the good reasons why we didn’t have time to do what we should have done, to stop sliding our eyes away from the pain we have participated in. Lo tuchal lehitalem- you shall not hide yourself, you shall not be indifferent. We are not permitted to look the other way, to continue with our lives as routinely as before. Hiding the truth from ourselves and not acting to help others is a direct prohibition. Indifference to our world is intolerable, unethical and it breaches our morality. As we continue the run up to Rosh Hashanah, the annual Heshbon ha Nefesh – accounting of our soul, we need to strip away the pretence, come out of hiding and look clearly and dispassionately at our world and our place in it. 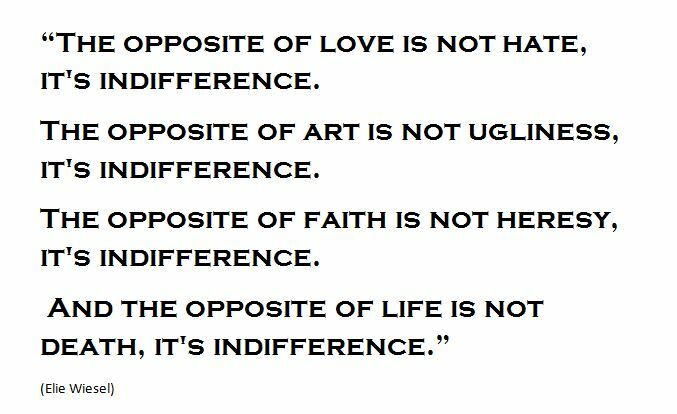 Losing our indifference might be the best thing we do all year. This entry was posted in Jewish Values, Not remaining silent, parashat hashavua by sylviarothschild. Bookmark the permalink.